1. Whisk together the flour, 2 tbsp sugar, baking powder and salt. 2. Add the cream and vanilla and use a wooden spoon to stir until the batter just comes together (about 8 turns around the bowl). 3. 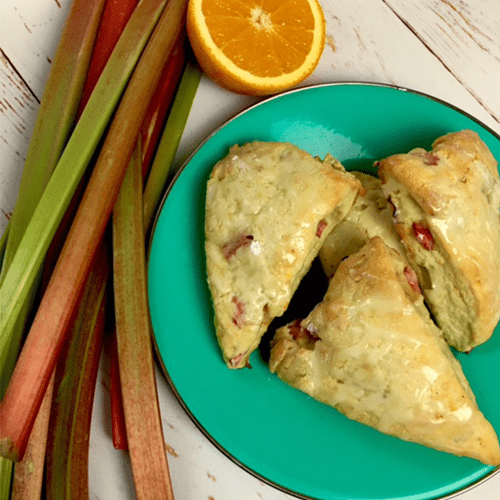 In a separate bowl stir together the rhubarb, orange zest and remaining 1 tbsp sugar and mix into the batter until just combined. 4. Turn the batter out on to a floured surface and knead a couple times (3-4) just to bring to dough together in a circle that’s about 1″ inch thick. 5. Brush the top of the round with heavy cream and sprinkle evenly with more sugar (optional). 6. Cut the circle into 8 even triangles and place each triangle on to a parchment lined baking sheet. 7. Place into the oven on the middle rack and cook for 18-20 min. or until slightly browned on top. 8. Remove from the oven and allow to cool. 9. Mix together the orange juice and icing sugar until you have a thick homogenous glaze. Drizzle over the cooled scones and serve.